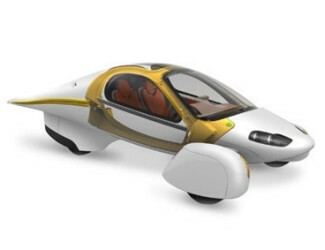 The Aptera was designed from the ground up as an electric vehicle, and later as an extended range electric vehicle. After building the proof-of-concept Mk-0, we hired the automotive design firm, 'eleven', to help us further develop the concept vehicle. The 'eleven' team, led by Jason Hill and Nathan Armstrong, made great strides in the development of the Aptera's body styling, interior design, and structural engineering. Meanwhile, we refined the Aptera's shape to maximize efficiency using CFD (Computational Fluid Dynamics), developed and built advanced suspension and drivetrain components, and integrated a strong yet lightweight composite shell. Our entire process has been developed in-house exclusively by Aptera for the Aptera Typ-1. Our structural elements have undergone countless revisions of FEA (Finite Element Analysis) to be lightweight, robust, and manufacturable.